Rated PG-13 for disturbing thematic content and images. 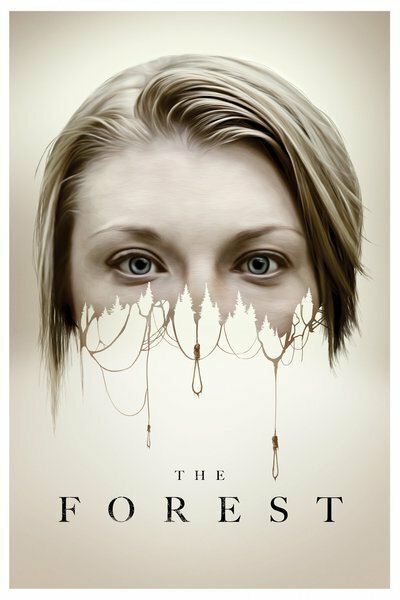 For a while, "The Forest" defies expectations. We're used to the usual scare sequences, in which some eerie music plays on the soundtrack while some character wanders through a spooky locale. The music builds as the inevitable startle moment approaches, and when it arrives, there's the dissonant, deafening sting to accompany the howl/screech/yell of the frightener and whatever terrifying form it takes (monster, masked killer, pale demonic child, etc.). In his debut feature, director Jason Zada doesn't quite take the usual route. Sure, our protagonist wanders through an assortment of dark, potentially haunted places, but that score is absent. There's a reliance on building tension with editing rhythms and ambient noise here that theoretically is refreshing. When the inevitable does arrive, that jarring music cue is absent (the growl/shriek/scream is, of course, still present, because the audience's reflexes have to be tested somehow). Zada clearly knows that the usual tactics have grown stale and predictable, and while he isn't exactly reinventing the wheel here, he's at least reducing some of the traction by eliminating an aural redundancy. It doesn't last for the entirety of the movie, though. That would be hoping for too much at a time when it seems that every other (if not every) mainstream horror movie feels obligated to end with a shot of the visage of some allegedly frightening entity rapidly approaching the camera. This movie does not buck that trend, and indeed, the other cheap, familiar tactics eventually show up here, too. In the meantime, there are plenty of other ones to compensate for the ones that are absent but not missed. The story follows Sara Price (Natalie Dormer), who has come to Tokyo after receiving a call from local police that her twin sister Jess (also played by Dormer) has gone missing (it's a little amusing that Sara shows people a picture of Jess when all she really needs to do is point at her own face and say, "But she has black hair"). Jess was last seen walking into Aokigahara, a forest at the base of Mount Fuji that has become known as the "Suicide Forest," on account of the considerable number of people who end their lives within it. Legend is that spirits in the forest feed on people's sadness, driving them to suicide. The sisters, of course, have a traumatic event from their past that is easy fodder for the spirits. Sara is determined to search the woods for her sister, even though everyone warns her not to venture into the place. She's eventually accompanied by Aiden (Taylor Kinney), a travel magazine writer who thinks her story would make for a good article, and Michi (Yukiyoshi Ozawa), who makes regular rounds through Aokigahara to search for bodies. The screenplay by Nick Antosca, Sarah Cornwell, and Ben Ketai is in a rush to start, with the movie's expository scenes playing out in flashback as Sara arrives in Tokyo, but still takes a long while for anything significant to happen. As Sara uncovers more details about Jess' activities leading up to her disappearance, the movie offers scene after scene of her walking through darkened spaces, winding up startled, and realizing that it was all just a dream (the "It was only a dream" gimmick occurs so often that it deflates whatever tension may exist in the earlier scenes). Whatever difference Zada's relatively minimalist approach to scenes might make, it does not outweigh the overarching feeling that the movie falls into a predictable, repetitive routine. The central locale (a real place with depressing, ever-increasing statistics that might make one question the taste of exploiting/publicizing it) holds a lot of promise. That promise, though, is only realized in fleeting flourishes—menacing fog rolls through the forest, tape and rope connected to trees serve as guides to the bodies of those who wanted to be found, a river seemingly changes course to discombobulate Sara. That last one points to the method of much of the movie's third act, which raises questions of what is real and what is imagined. There's little rhyme or reason to the confusion. It's just a matter of convenience to lead the story to its underwhelming, sort-of twist. The admiration for the little that Zada does differently in the early sections of "The Forest" does not last for long, as the movie repeatedly hits the same beats over and over again. Zada's film ends up feeling like an extended journey to a predestined shrug of a conclusion.